Home humidifiers add moisture to the air in baby's room during winter months when home heating dries the air. 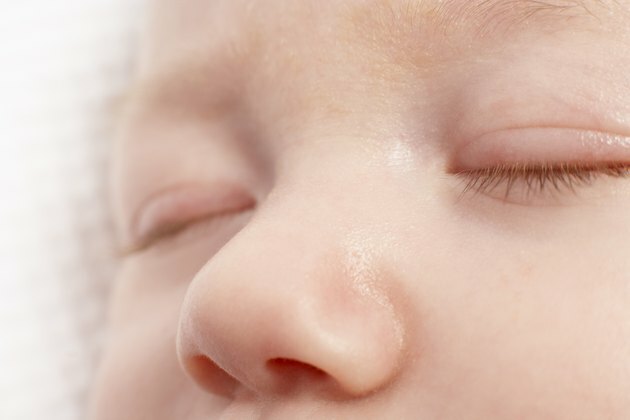 Dry air, according to the Monroe Carell, Jr. Children's Hospital at Vanderbilt University, irritates baby's eyes, nose and mouth. You'll need to monitor the humidifier to make sure the central or portable unit stays free from mold, mildew and bacteria growth. These growths create additional problems for your baby. Fill the water holder of the cold-water humidifier with clean tap water and set it in an area that allows the moist air to cover the entire room. Chose a setting that keeps the air comfortable to breathe but doesn't allow moisture to form on items in the room. Position the air so it flows evenly throughout the room and not directly on baby or the crib. Clean and dry the humidifier daily to remove stale water and any mildew or mold. Use bottled water for the tank in regions with tap water mineral deposits. This avoids clogging the steam mechanism with deposits and also reduces the risk of lung injuries from breathing the mineral powder. Select a location where baby can't reach the humidifier or pull the electric cord on the device. Avoid using hot-water humidifiers to reduce the risk of burns from accidents. Research your humidifier brand and model using the online information published by the United States Consumer Product Safety Commission. The CPSC list helps you identify devices with the potential to overheat and cause fires. Pediatrics: Inhalational Lung Injury Associated with Humidifier "White Dust"
Are Humidifiers or Vaporizers Good for Infants? Is it Safe to Use Vaporizers on Babies?